Make a positive first impression through effective packaging design. We are devoted to manufacturing high quality packaging solutions that will boost your efficiency and profitability. Our in-house design team can help you with everything necessary to get your packaging design project completed to your satisfaction. 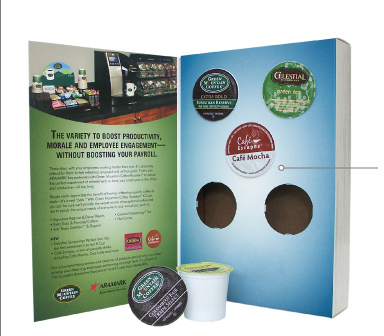 Pump up your packaging with custom die cut inserts to safely house your product. We provided the structural design of this piece. We also die cut the provided print sheets, converted, assembled, shrink-wrapped and distributed. Whether you’re launching a new product, updating your brand identity or simply looking for more innovative packaging ideas, Pack Appeal is positioned to meet your packaging needs. Choose from point-of-purchase displays, give-a-ways, promotional products, portfolios and much more! Looking for some creative ideas with Packaging? Check out our Interactive Photo Galleries - Look for a link on the bottom of each product family. We offer a breathtaking range of design, construction style, material and decoration choices. Put us to work for you today and receive expert in-house product design, production and fulfillment capabilities. Call us today!